Pointer and setter enthusiasts will have been saddened to hear of the death following a short illness, on November 11th 2011, of Brenda Partridge at the age of ninety-five. Gordon Setters were Brenda’s first love and her influence is still strongly evident in working Gordon setter lines to the present day. Brenda Gwendoline Partridge was born in Northamptonshire in 1916. She trained as a nurse at Leicester Royal Infirmary from 1935 and went on to study midwifery in Edinburgh and London. Always keen on dogs, Brenda’s interest in Gordon setters was kindled when she moved to Devon in 1956 and became friends with a nursing colleague, Joyce Damerell. The two nurses discovered a mutual interest in gundogs generally and Gordon setters in particular and it was Joyce who gave Brenda her first Gordon puppy, Sheena, in 1959. Brenda adopted ‘Clitters’ as her kennel affix, taking the name from the local word for the outcrops of granite rocks seen on Dartmoor. Brenda began by showing her dogs but was always more interested in using them for their true purpose in the shooting field. In 1964 with Joyce Damerell she attended her first field trial on Lord Rank’s state at Sutton Scotney and was disappointed not to see any Gordon setters competing. Impressed by the friendly welcome and helpful advice she received from some of the competitors she decided to try her hand at that summer’s grouse trials. Stella (Clitters Bannock), a daughter of Brenda’s original Gordon Sheena distinguished herself in her first trial by not only coursing but catching and retrieving a hare, prompting one of the judges, Dr. Hanley from Ireland to observe that ‘ye’ll never go hungry with that dog’. Better results were to follow when Brenda bought a working/trialling bred Gordon setter, Katy Gordon, from Tom Conlon in Dublin on the advice of Lady Auckland whose FTCh Joker of Cromlix was the sire. In addition to taking a number of awards in trials Brenda also worked Katy as a shooting dog. In her early days Brenda recalled that Katy was often the only Gordon setter entered for stakes. By the early seventies there was a strong nucleus of Gordon setter handlers, including George Burgess, Dr Michale Thompson, Bob Truman, Mike Daw, WilsonYoung and Penny Darragh among others. Trialling could be hard work in those days before the advent of the modern 4WD vehicle and often meant trudging up steep rocky tracks in order to get a run. 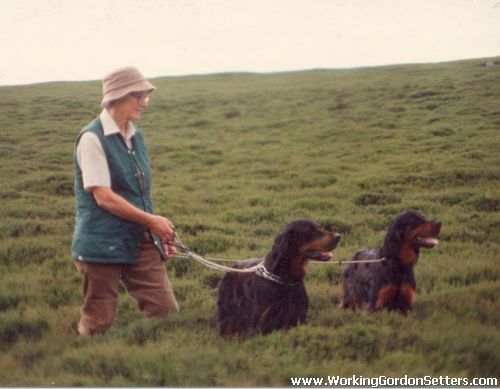 A founder member of the West Dartmoor Working Gundog Club, Brenda was always keen to encourage others to take up trialling and became involved in running training weekends for newcomers to working pointers and setters. She was an early advocate of hip scoring for Gordon setters and always keen on shooting over her dogs as well as running them in field trials. Brenda was also an accomplished writer, contributing a number of articles to magazines, always extolling the virtues of her favourite breed and encouraging others to discover the charms of the Gordon setter. Her Clitters affix lives on in the capable hands of Nicola Harris.